Things happen to your vehicle that are beyond your control and are stressful and frustrating to deal with. A routine auto repair is not a difficult service to find, but locating reliable window repair can be a challenge. Not every company offers certified technicians or 24/7 services. PG Sun Valley auto glass repair specialists treat every automobile owner with respect and professionalism to make the repair process more of a pleasant experience. A traffic jam may be one of the least liked scenarios that you have to deal with in a daily commute. Dealing with a collision during a traffic jam that involves broken glass can easily intensify your anger. Sitting and waiting for help can feel like an eternity if you do not have a reliable source for prompt assistance. PG auto glass repair in Sun Valley responds quickly to calls for window repair. A peaceful evening away from the home can quickly be ruined when vandalism or other acts of destruction happen to your vehicle. The state law prevents you from driving your car or truck with windshield damage that obstructs your clear view of the road. PG Sun Valley auto glass repair experts offer after hours repairs when such an unfortunate accident happens to your vehicle. Dealing with roadway construction while driving easily takes away precious time from your daily schedule. An inattentive construction worker can make a mistake or misjudgment that may bring damage to one or more of your windows. PG auto glass repair in Sun Valley knows such accidents can happen and quickly dispatches technicians to restore or replace your vehicle glass. Fixing any type of damage to your automobile windows may appear easy, but replacing a broken window is a more complicated task. PG Sun Valley auto glass replacement experts can remove your damaged glass and replace it with strong and durable OE glass. A lifetime guarantee is always provided to remind you that your window will be free of leaks and errors when you choose PG auto glass replacement in Sun Valley. Are you looking for a reliable auto glass repair and replacement service in Sun Valley, CA in zip codes 91352 or 91353? 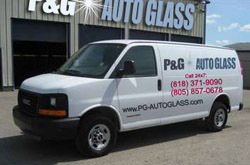 You can contact PG Auto Glass for all you repair and replacement needs.